Eloise “Weedy” Thomas, 95 years of Xenia, passed away on Friday September 28, 2018 at the Xenia Health and Rehab. She was born in Paint Lick, KY on September 6, 1923, the daughter of the late Alice Pennington. Besides her mother, she was also preceded by her husband, Milton “Whitey” Thomas, brother, Jack Jones and her grandparents, John and Maggie Pennington. 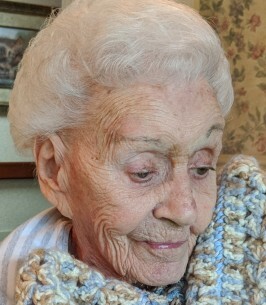 Eloise was a member of the Strait Creek Church of the Brethren, did the sewing for the Eastern Star and retired from Martin Marietta after many years of service. Eloise is survived by her son, Robert “Ernie” (Billie) Thomas of Merritt Island, FL, daughter, Kathy (Barry) Swearingen of Wilmington, five grandchildren and several great and great great grandchildren. Funeral Services will be 12:00 PM on October 1, 2018 at the Wylie-Thompson Funeral Home in Sinking Spring. Burial will follow at the Pleasant Hill Cemetery. Friends may visit from 10:00 AM until time of services on Monday at the funeral home. The family would like to thank the Kindred Hospice for their love and support and a special thanks to Miss January for the care that she provide for Eloise. To send flowers to the family of Eloise Thomas, please visit our Heartfelt Sympathies Store.